When the travellers come home, their success stories in their pockets, it is a great thing to sit and listen to them. 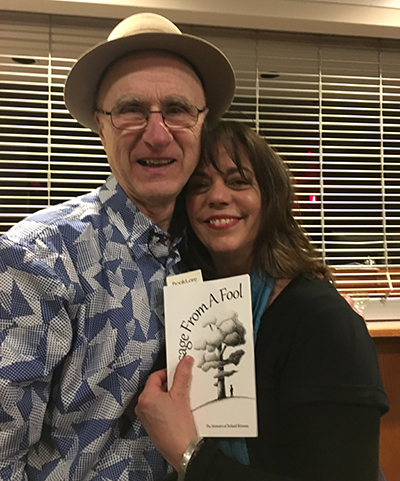 This was so with a packed Orangeville Opera House earlier this week, when Michael McCreary and Roland Kirouac brought those stories to us, with their new books. They are interestingly contrasting and similar to each other. Mr. McCreary is in his twenties and Mr. Kirouac in his eighties. Michael is autistic; Roland comes from an abusive childhood. Both have achieved success, in spite of it all, with their personal passions as performers, artists in their fields. Both men have recently published their memoirs. Michael's book is Funny, You Don't Look Autistic, Roland's A Message from A Fool. As much a book of a fascinating portrayal of his life so far, Funny, You Don't Look Autistic is, almost a how-to book. Michael has provided a much needed, much appreciated book about being autistic from his side of the spectrum. It outlines his determination to muddle through the obtuseness of the neurotypical – those folk who are not autistic, to hone his understanding of what is going on around him and to turn his personal take on autism into comedy. With comedy, he is carving out his life as a stand-up comedian. He leads his reader through his own life and times, from his use of language as a tiny child – lines from movies – to his first jokes at elementary school, to his cross-Canada tour. Travelling with his father from coast to coast, Michael's take on the audiences and his own part in their entertainment is sometimes very funny and, sometimes real food for thought. What he does, is teach us, the neurotypical, what is autistic, as it applies to him. He gives us some insight to the probable similarities within the Autism Spectrum Disorder (ASD). Keeping this in mind, he assures the reader that every autistic person is an individual and that autism is a characteristic, not a character. It is simply a part of who a person is, not the whole person. The evening was billed as “Books on Stage, A Evening of Entertainment and A Book Launch with a Difference.” It was all that and more, but it would have been hard to anticipate the format and, as a evening at the theatre, it may very well have been a one-off. The gentlemen acted out their books, instead of the usual presentation (also very entertaining) of readings and conversation. A stand-up comic, Michael did just that, regale the audience with some of the stories in the book, some about his mother and other stories that are not in the book. He kept us laughing and clapping for his part in the show. An interlude to change the props on the stage and we welcomed Roland Kirouac to the platform. Imagine that you can't remember any of your birthdays before your 15th. On that specific day, you are walking home, to an abusive home with a deaf, beaten mother and a brutal alcoholic father, when suddenly you stop. Just there, on that spot, which is just a spot with no significance until this very second and, in that second, your life is transformed by the revelation that comes to you, by the message from a non-corporal fool. This is the beginning of Roland Kirouac's presentation of A Message from a Fool, through which he danced all the time, a graceful, flowing ballet, with his story telling to match, that kept us completely in his grasp. His passion, his pain, his tremendous joy. His revelation directed him to his love of dance. A mild way of saying it: he was devoted to dance. It took away his pain and the paucity of his life. Since he was 12 years old, he used to go to the local dance hall, to watch where the men came to dance with the “Best Ladies.” They moved and swayed and the men lifted the ladies up high in the dances. The boy, Roland, looked on with growing intensity and desire to be one of them. He watched their feet, their moves; he copied them and learned from them surreptitiously until he too could dance. There was no turning back once the ideas started to fill his head. That he would leave the sad, impoverished life for the lights, beautiful dancing partners and his new life of being the “golden boy” has been a life-long wonder to him. He became, additionally to a dancer, a choreographer, Artistic Director and Entertainer. His list of achievements and accolades is long and distinguished. This evening was, as have been all the authors' events at the theatre, a collaboration between BookLore and Theatre Orangeville. The proceeds from the evening were in favour of the Orangeville Wolves, the special needs hockey team with which Michael played as a youngster. Also, to support the youth programs with Theatre Orangeville. Needless to say, Funny, You Don't Look Autistic, by Michael McCreary and Message from a Fool, by Roland Kirouac are both available at BookLore.